pedestrian, philosophical ramblings. mostly about food. So my #1 transit advocacy goal basically boils down to convincing hipsters to ride the bus. (This goal only seems more timely with the recent debate about Mayor De Blasio’s proposed streetcar.) City buses are underrated, and until that changes, we’ll never have the bus service we need and deserve. I say “hipsters” as a shorthand for urban-minded young people, especially transplants; even many of the self-professed transit enthusiasts I know take a weird sort of pride in not knowing where most bus routes go, or in never taking the bus at all. Now that I’ve been recovering from knee issues for a couple of months, I feel the need for reliable bus service even more viscerally. Sometimes the bus is the deciding factor in whether I can get to work or not, unless I want to spend ~$35 to travel a couple miles via Uber during surge pricing. On the bus I’ve been taking, the M103–which comes only about every 20 minutes during rush hour even though it allegedly has 10-minute headways–most of my ride companions are the elderly and schoolchildren. This is also true of the buses I ride more frequently in times of better knee health; hop on the B49 down to Manhattan Beach and it’s full of older people chatting to one another; catch the B103 at Beverley in the morning and get a seat only because of the vast number of students exiting at that stop. It’s exactly these travelers, who may not be able to take the subway, or drive, or pay for a taxi or car service, who rely on the bus the most. * And it may be difficult for them to stand and wait for it for half an hour, or to dig their way over to the curb through snowbanks, as Gothamist‘s Nathan Tempey has recently detailed so devastatingly. Of more mundane but no less damaging consequence, at least in my mind, are the taxi and other drivers who stand or park in the bus stop, making it difficult for bus drivers to see the people waiting. I recently told my father I’d prefer if these drivers hung out in front of fire hydrants; there, their risk of inconveniencing and harming people is, in my mind, comparatively slight. Of course, buses are not without issues. Even those who do ride them often like to hate on them, with frequent causes for frustration like bus bunching. Still, much like I implore you to blame the governor, not the MTA, for fare hikes and poor subway service, I would implore you to level your accusations that way, and at the legislature and others who can improve traffic conditions, not at the buses themselves. And, while you’re at it, check out a bus map and see if one of our city’s routes can take you where you need to go. *In fact, the ability to pay is key here: in my current state, I’m focusing on the lack of adequate bus service as a mobility issue, but of course it also signals a class (and race) divide in how easily we can get around our city. Check out Enrique Peñalosa’s TED talk, where he nails this point far more eloquently than I can, arguing that “an advanced city is not one where even the poor use cars, but rather one where even the rich use public transport.” Amen. An unfortunately-not-too-rare sighting of what Magnus Mills calls the “Three Bears syndrome” in The Maintenance of Headway, his entertaining take on the life of a bus driver. I’ve increasingly found myself warming to a category of restaurants and bars that I would classify as “overrated but pretty damn good.” The pizza pantheon’s Di Fara and Franny’s immediately spring to mind, as does La Colombe, whose draft latte I enjoy, even in the winter. The most recent addition to my category comes in the form of cafe Maman, which now boasts 2 trendy locations, in SoHo and TriBeCa. I’ve dropped into the SoHo one numerous times on my way to work or class to pick up some coffee, Maman’s rich version of an Oreo, and any number of other pastry treats. The newer TriBeCa cafe is home to a dining room where I have now experienced both brunch and drinks. Brunch is a (slightly overly) leisurely affair, with decadent yet healthy-seeming options like green tea waffles and smoked salmon on black bread. About that leisure: Maman was still working out a couple of logistical snags at the time of my visit, but luckily for me, my server was extremely courteous and apologetic, and even comped me my brunch cocktails, including a delightful hot chocolate spiked with amaro and walnut liqueur. If you’ve got a morning or afternoon to while away in TriBeCa (brunch ranges for the incredible span of 9-3), I would definitely recommend a seat at Maman’s communal table. If you’re in a hurry, you can pick up a pastry, salad, or sandwich at the front counter, perhaps consuming it on one of the ridiculously fluffy couches that greet you upon your entry. When I came back for drinks a few days later, the dining room was empty, which was a shame for everyone else’s tastebuds. I, on the other hand, got to sample two delightful beverages: the Santahattan, a nice strong wintry blend of pine, rye, mint, and sweet vermouth, and a frothy teacup of Papa Peanut, slightly bitter and very peanutty and creamy. My server was extremely friendly, and I hope that she will soon have more customers to while away Tuesday nights. I know I will be back to try some of the menu’s intriguing food options like stuffed squash and corn spaghetti. Unfortunately I haven’t had too much energy to eat and write lately. But I’ve still encountered some quality dining establishments. Like DUMBO’s Love & Dough, a new Neapolitan pizzeria just around the street from an old office of mine. Though I work near Chinatown now, aka the world’s lunch capital, Love & Dough made me regret my Manhattanizing ways. It’s hard to imagine an escape from the workday grind as thorough and satisfying as my lunch at Love & Dough’s bright, airy corner location. And there’s no comparable pizza within a reasonable radius of my office, in terms of both taste and unique combinations of ingredients. The Surrpressata!!! (emphasis theirs) delivers both soppressata and surprise: hints of spice play enticingly with dollops of ricotta and a cherry or two on each slice, while a mint leaf proves an unusual though not unwelcome substitution for basil. My dining companion’s eggplant pizza was also quite tasty, and both were filling enough that, alas, we had no room for what was sure to be a delicious dessert. Friends, next time you’re in Brooklyn’s DUMBest-named neighborhood, you know where to go. Seems like all the cool kids are hanging out in Bushwick and Ridgewood (and, I predict, Glendale soon enough) these days. It’s almost more than your South Brooklyn correspondent can handle. Luckily, I am an intrepid and dedicated reporter. The Bad Old Days (whose name I must confess I don’t really care for (better than Good Old Days, I guess; glamorizing crime and grime isn’t really my thing)) is a solid new entry to the bar scene. Located just a couple blocks from Myrtle-Wyckoff’s junction of the L and M trains, it’s got a cozy living room atmosphere (with entertaining bathroom wallpaper for the urban-history-inclined of us), reasonable prices and, most importantly, damn tasty drinks. I especially liked the Winter Vixen, with its mix of rosemary-infused gin, cranberry, and Lillet. It struck just the right note of holiday cheer while remaining light and refreshing, appropriate for our apocalyptically hot December. I also enjoyed the Manhattan Special. Its mixture of rye and maple reminded me of the day I really got into cocktails in the first place, dragging my then-pretty-new boyfriend on a mad trek across Williamsburg and Greenpoint to Dutch Kills after reading about a similar concoction in a magazine. Four years later, we are cocktail experts, while rye and maple (and a coffee ice cube!) remain as winning a combination as ever. Not so far away from Bad Old Days, in a very different sort of atmosphere, is the tasty Amaranto (recently acclaimed by the New York Times). Though I was drawn in by the tamale mentioned by Ms. Mishan, what really won me over was the tostada, a perfect mix of textures with crab, avocado, fennel, radish, and tortilla crunch. The stuffed avocado was less beautiful to behold but just as tasty. My elote and mezcal cocktail, garnished with a corncob, was an enjoyable foray into savory drinks; while the blackberry flan we had for dessert was creamy and delicious. I look forward to more trips back up to the Brooklyn/Queens border. The Upper East Side is not exactly my favorite neighborhood. If you know me, you will know the extent to which that’s an understatement. But sometimes an intriguing establishment will induce me to make the trek uptown; and sometimes it’s worth it. I recently experienced one such success when I stopped by Eli’s Night Shift, the new bar from Eli Zabar (the new Za-bar?). Unlike so many places in Manhattan, the atmosphere is inviting, with a ton of windows; and the service is friendly–my bartender immediately inquired about my reading material (These Shallow Graves, if you’re interested), and it turned out he’d just read another book with the same setting. The list of drinks is similarly approachable, but still intriguing. The bar features beers from New York City-area brewers, including my favorite, Transmitter, and other good options like Gun Hill and Grimm. (And there was nary an Other Half in sight, at least when I visited; in my opinion, Other Half is the most wildly overrated brewery around. More about that another time, perhaps.) Prices are somewhat high (do fairly straightforward beers really merit an $8 price tag? I guess things are more expensive in NYC’s frozen northlands) though the selection is top-notch. But I came for cocktails, and I was not disappointed. The Last Shift was an elixir of such comforts as bourbon, pumpkin, and milk; the Blue Vest, a beautiful concoction of gin and prickly pear shrub. While I don’t usually like cucumber, the garnish was resplendent, and played well with the botanical flavors of the gin. I also don’t usually care for potato chips, but the free ones on offer at the Night Shift were so tasty that I may have to reconsider my position. The rest of the food menu looked good as well, but was obviated by the heaping basket of chips. Luckily, once you just can’t stand being above 23rd Street anymore, you can make a quick exit: the Night Shift is just a short hop away from the 6 train and the Lexington Avenue buses, so you can easily head home, taking your grudgingly positive feelings about the Upper East Side with you. As I’ve said before, I am pretty preoccupied with pizza lately. The best of the new crop of pizzas I’ve tasted is almost certainly Pizza Moto. I’d tried one of their pies when a friend ordered it from Smorgasburg, and it was pretty good, but I have to confess that cooking pizzas in the frenetic open-air crowds always struck me as a fool’s errand. Luckily, Pizza Moto has recently opened a small restaurant under everyone’s favorite eyesore, the BQE. If you have the fortitude to cross the street to the southish side of Hamilton Avenue you’ll be glad you did. * PM immediately transports you from the underpass through its eclectic and mechanically-minded decor and friendly service. The pizza I tried, a three-cheese many-mushroom configuration, had just the right mixture of cream and crunch. My grapefruit and mezcal drink provided a refreshing counterpoint, but the best concoction to come out of a cocktail glass was surely an almond semifreddo studded with biscuits and a cherry. (I could’ve done with more than one cherry, but that’s just quibbling.) Much like the pizza, now that I think of it, my dessert was creamy and crunchy and satisfying. Though I was quite full, I could’ve happily eaten another, Thanksgiving aftereffects be damned. Faced with Hamilton Avenue and its rushing cars, your correspondent flagged a bit. Luckily, there is a bus stop around the (admittedly industrial and bleak) corner, so I was able to avoid the crossing again. With my leftover pizza box in hand, I was surely the luckiest of the B61’s patrons tonight. Life has been busy lately so I’m afraid I haven’t had a chance to write up my edible travels for you. Know that I am soldiering tirelessly on your behalf to discover the city’s best new doughnuts, cocktails, and breakfast pastries; I just haven’t had a chance to string together a few non-work-related thoughts. Please bear with me. 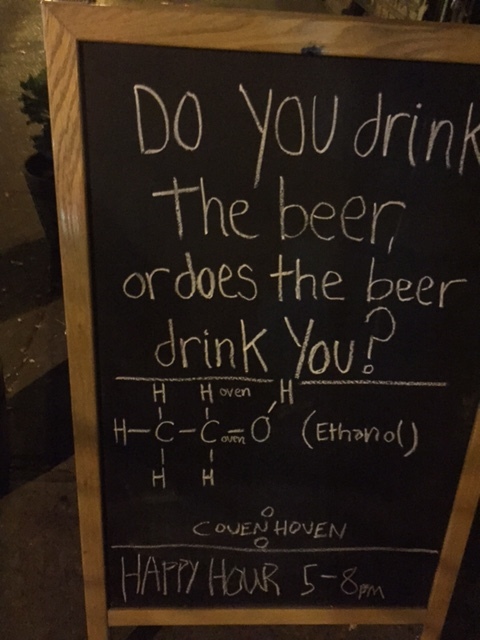 In the meantime, perhaps you will enjoy pondering this deep question from Covenhoven, home of pretty exciting beer. Blame it on Delancey. After reading Molly Wizenberg’s description of opening a pizza restaurant, I am way more enthusiastic about pizza than I used to be. Lucky for me, I have a lot to catch up on. Like Crown Heights’s Barboncino, which I’ve walked by about 500 times without ever going in. 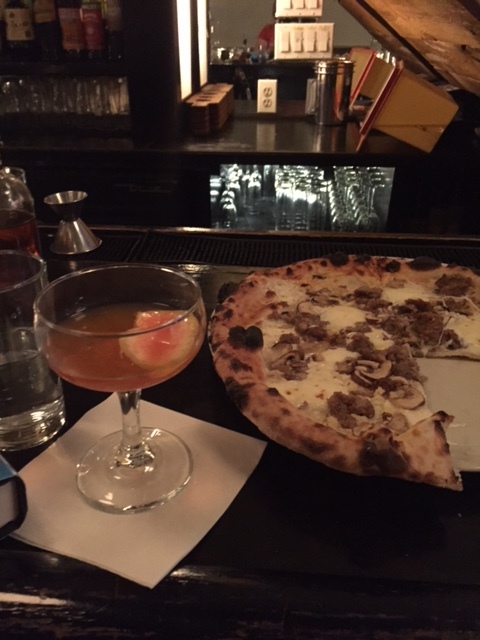 Until tonight, when I discovered amaro-based cocktails ($2 off for happy hour) and a pretty satisfying pizza. I particularly liked the Primavera cocktail, with its nice balance of grappa, Aperol, Meletti, and grapefruit. A little bitter, a little sweet, and the perfect way to cap off a long day. The pizza was no slouch, either–fennel sausage and, especially, cremini mushrooms elevated it to a decadent level. Luckily, my bartender readily offered to wrap up the rest for lunch tomorrow. She also had a good followup cocktail recommendation, a bitter and champagne-sparkly iced tea. I told her I’d be back soon and I mean it, since I intend to try basically every other cocktail (and many other pizzas) on the menu. Care to join me, anyone? I have a confession to make. Though I suspect food and drink are my writerly calling, I sometimes dream of being an expert on my other, less comestible, passion: transportation. I’ve researched and written about many transportation issues for grad school, but I’ve never offered up my thoughts in a public forum like this blog. But now’s as good a time as any to get started on a theme that’s dogged me for my whole life. Ever since I was a tiny (okay, tinier) kindergartener with a somewhat-lengthy commute to school, I’ve been invested in transportation, a topic close to the hearts of all New Yorkers. I hope I’ll transport you with many a story in the future, but right now I want to call your attention to one specific cause: the Verrazano-Narrows Bridge, glorious connector of Brooklyn and Staten Island. Okay, now that you’ve thought about the Verrazano for a moment, consider some of NYC’s many other impressive bridges–the Brooklyn, Manhattan, and Williamsburg ones, for starters–and then think about how, if you’re like me, you’ve walked across them countless times. (Or at least you plan to–I’m ashamed to admit it, but I’d never walked a bridge until a college classmate suggested it not so many years ago. I like to think I’ve made up for lost time and ground in the intervening ten years or so.) 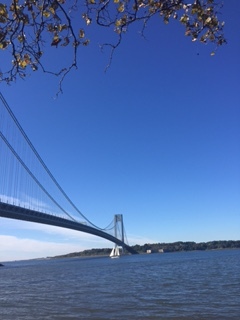 But the Verrazano–so big and glorious that its engineers had to take the curvature of the Earth into account! (possibly my favorite factoid from Robert Caro’s marvelous The Power Broker about our local master builder and master monster Robert Moses)–boasts no such paths. The MTA has recently begun a pilot program for racks on buses so that two–two!–bikes can ride astride the prows of buses crossing the bridge. But other than that, if you want to cross that breathtaking span without a motor vehicle, you’d best train for the NYC marathon (or the Five Boro Bike Tour, thanks, Mark), ’cause that’s the only way you’ll manage. So what if you, too, could walk or bike the Verrazano? What if you could satisfy your wanderlust, or visit your family, or do whatever else you’d like to do on Staten Island, without need of a car? That’s the dream put forth by Transportation Alternatives and the Harbor Ring Committee, and it’s been a dream of mine too, ever since I first got the bright idea to take the ferry from Manhattan to Staten Island and the bus back to Brooklyn, only to realize how frustrating–and hazardous for a pedestrian–it was. And so last Saturday I found myself volunteering for TransAlt’s rally to make a bike and pedestrian path a reality. At the rally, Bay Ridge and Staten Island residents and elected officials, plus runners, cyclists, and curious and even initially skeptical passers-by, offered a broad base of support for crossing the Verrazano sans car. I suspect I’ll always remember one attendee saying that she’d been advocating for a pedestrian and bike path since before the bridge was even built–certainly more commitment than I could ever claim. And, perhaps even more excitingly, the rally’s organizers announced that the MTA is working on a feasibility study for the path. So keep your fingers crossed, and check out the advocates’ work, and maybe one day you can listen to me pontificate about transit and food as we walk across the dazzling height of the Verrazano.